"1, 2, 3, 4 We Won't Take It Anymore! 5, 6, 7, 8 No More Violence! No More Hate!" On Tuesday evening following a rally inside Hulman Memorial Student Union, students could be heard chanting and marching at Indiana State University. Students, faculty and the Terre Haute community packed the Dede I meeting room, huddled together and sipped hot chocolate, as President Dan Bradley kicked off the rally. "You have the right to live free from fear, whether that fear is at night, on the streets, at home or in the work place," he said. "This event should remind us all that we have an obligation to live our lives free from fear." 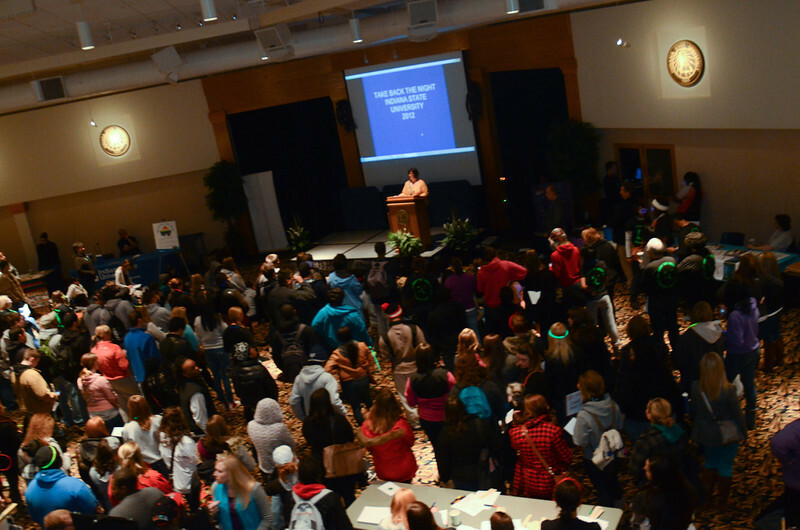 This annual event, Take Back the Night, is to raise awareness on domestic violence and to educate ISU faculty, staff and the Terre Haute community. Students from ISU's Women Studies 450 class organized the March and rally for a semester-long student activism project. They helped lead chants of, "Out of the halls, into the streets, we won't be raped we won't be beat," as they began the march. Whitney Morgan, a senior communications major, from Indianapolis, said the night proved a success because many students and community members attended allowing the class to reach out to so many people. 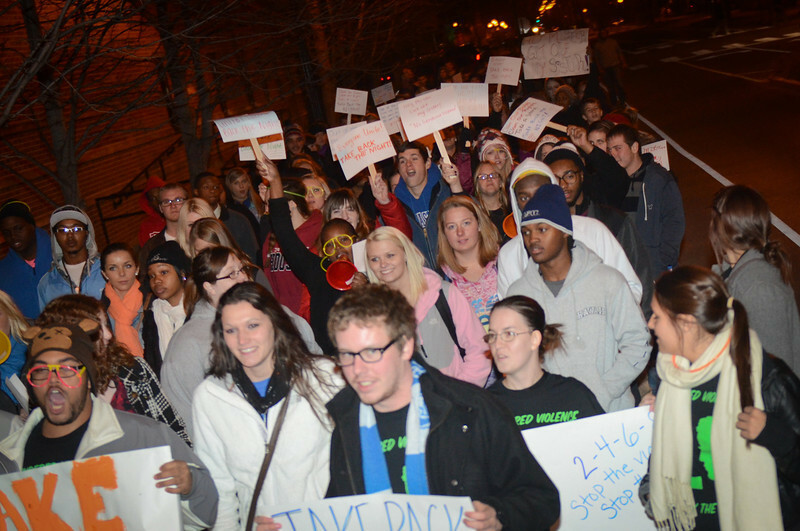 "Students and faculty came together and marched and were able to experience something life changing," said Morgan. Martha Reed, guest speaker and administrative assistant at the Indiana State Career Center said, "I had people reach out to me years ago and I had to reach within myself to be able to look forward." Reed read a poem about her experience to inspire students to reach out to family or friends experiencing domestic violence. "One in four people in this room will be touched at one point in your life by some type of violence," said Reed. "The realization that others have suffered the same fight awakens a new hope within you." Debbie North is an advocate against dating violence and domestic abuse through Heather's Voice, which she started in honor of her daughter after she was killed by an abusive boyfriend. When the Indianapolis resident spoke, the room became still as she told the brutal story about the murder of her daughter. "As I look out at all of you, my mind wanders to my daughter. I lost my daughter Heather, she was murdered by her abuser," she said. North described how her daughter's boyfriend stabbed and killed her daughter before burning her body, cutting up the remains and then driving "around the south side of Indianapolis throwing her in dumpsters." "He threw my daughter away like she was trash," said North. Before Heather's death, North said her daughter told her not to worry about her. "I was supposed to protect her; now my life is a nightmare that I never wake up from," she said. 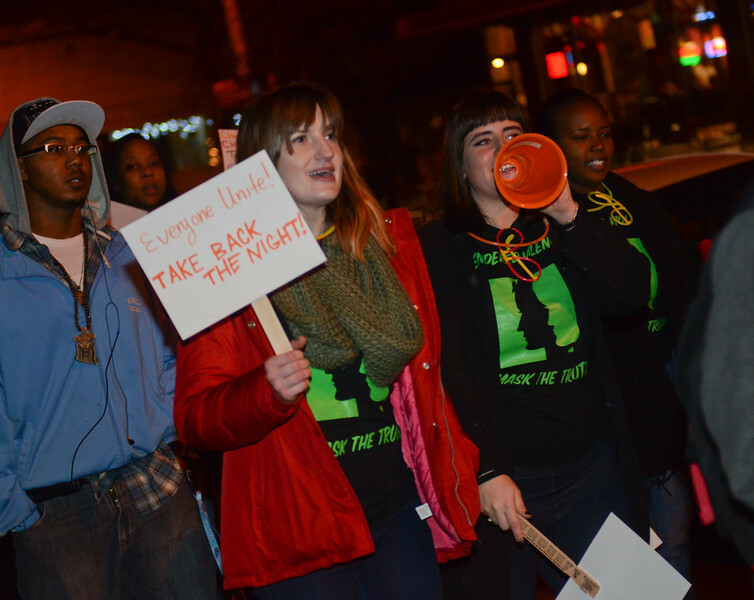 After the rally, the marchers filed out of HMSU began to chant: "No More Silence! No More Violence!" Take Back the Night raises awareness on domestic violence and educates ISU faculty, staff, students and the Terre Haute community.